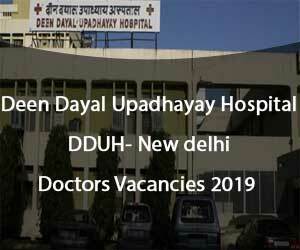 New Delhi: Deen Dayal Upadhyay Hospital (DDU New Delhi), New Delhi released 27 vacancies for the Senior Resident post on a Regular Basis and Adhoc Basis. The selection will be done through a walk-in-interview. The Walk-in-Interview will be held on 15th and 16th April 2019. Venue- Administrative Block, 1st Floor, Deen Dayal Upadhyay Hospital, New Delhi. The Vacancies are in the Department of Anaesthesia, General Medicine, Orthopedics, Radiology, ENT. Anesthesia: Post Graduate Degree (MD/DNB/DIPLOMA) in Anaesthesia. In Case of non-availability of MD/DNB/DIPLOMA Candidate, then Candidates who have 3 years post MBBS Experience with at least 2 years in Anaesthesia department will be considered for the post and will be appointed on Adhoc basis for 89 days. General Medicine: Post Graduate Degree (MD/DNB) in General Medicine. In Case of non-availability of MD/DNB Candidate, then Candidates who have 3 years post MBBS Experience with at least 2 years in General Medicine department will be considered for the post and will be appointed on Adhoc basis for 89 days. Radiology: Post Graduate Degree (MD/DNB/DIPLOMA) in Radiology. ENT: Post Graduate Degree (MS/DNB/DIPLOMA) in E.N.T. Age limit: 37 years as on date of interview as per order no. F.No.DH&FW/Q015/57/2016-HR-Medical-Secy(H&FW)CD No. #112425062/2413-18 dated 04/10/2018. Age limit is relaxable by 05 years for SC/ST candidates. Required Documents:- Application, 02 passport size photos, Matriculation and Sr. Secondary Certificate, MBBS degree and Mark sheets, MD/DNB/Diploma, Mark sheets and Certificate, Residence Proof & DMC Certificate, Experience, if any. 1. Age limit:- 37 years as on date of interview as per order no. F.No.DH&FW/Q015/57/2016-HR-Medical-Secy(H&FW)CD No. #112425062/2413-18 dated 04/10/2018. Age limit is relaxable by 05 years for SC/ST candidates. 2. DMC registration:- Candidate must have valid DMC Registration with PG degree/Diploma or applied for on the date of Interview, the original DMC Registration has to be produced before joining. 1. 3% seats shall be reserved for physically handicapped persons as per rules. 3. In case, SC/ST/OBC candidates are not available for SR, the post shall be filled for 89 days on adhoc basis from General Category Candidates and vice versa. 4. The appointment and services will be governed under Residency Scheme of Govt. of India. 5. All appointment shall be subject to medical fitness and verification of certificate of educational qualification /age/caste/submission of valid DMC registration certificate and internship completion certificate etc. NOTE- Only those candidates may appear who fulfill the above criteria and have necessary documents with them. Originals will also be required to be produced at the time of interview. All interested candidates are advised to download the application form annexed below for appearing in Interview as no application form will be provided at the time of interview.